Later today (7 pm Japanese time) there’s going to be a Moonriders concert that’s also going to be streamed live on Itoi’s site. If you’re interested, check here when the time comes. I’m not exactly sure what time that would be here, but it’ll probably start sometime in the morning for most of us. 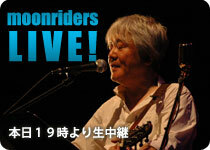 For those who don’t know: Moonriders is the band Keiichi Suzuki is in. Keiichi Suzuki did a lot of the music for EarthBound and EarthBound Zero. You can find more info about him and Moonriders here. UPDATE: The concert is over, but you can see a recording here. I haven’t watched it myself so I don’t know what songs they play. I don’t expect any game music but who knows. That would be 6AM EST. Too bad I don’t have plans to wake up that early… someone should record the webcast. It isn’t obvious where the webcast will be though… I assume the normal web page will be replaced when the time comes? Definitely not waking up that early, haha. I second the notion of someone recording the webcast. So, who will we task with recording this? At least, that’s what’s streaming right now at 8:53 AM EST. Wait… the Livestream is still going on for some reason, focused on a fish tank, but UStream was stopped. Sweet, I’ll be watching that later. Thanks blahmoomoo! Itoi’s site said they’ll only have the video online for 24 hours. I don’t know if they did it through ustream or not though. I watched the concert earlier through the ustream link. It was pretty nice. Nothing from MOTHER, but I don’t think it would have fit with the rest of their set. I somehow recognized one of the songs, where they sing “I love you / I hate you”, but I’m not sure where I’ve heard it before. Woah. At around 1 hour 15 minutes, they play an awesome rendition of the theme from Federico Fellini’s “La Strada” (by Nino Rota). That’s my favorite movie score of all time. What a pleasant surprise.